Info "Life is all about seizing opportunity. So, when the right card comes your way, grab it by the lapels and shake it senseless!" 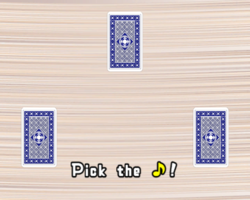 In the Cards is one of Ashley's Microgames in WarioWare: Smooth Moves. There will some playing cards with a picture on them. The player has to memorize them, and then they will be face down. They will then move around the table and the player has to pick up the card indicated later onscreen. The cards will be moving around, and when it comes to the player's hand that's when it should be picked up. 1st level difficulty: There are three cards. If the microgame is won, there will be two music bands. 2nd level difficulty: There are three cards, and there is one shuffle. If the microgame is won, there will be two magicians. 3rd level difficulty: There are four cards, and there are two shuffles. If the microgame is won, there will be six magicians. This page was last edited on February 19, 2018, at 22:48.